Or Six go Wild at Slimbridge……. 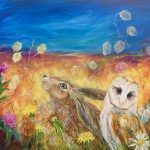 Artist Joan Gee (Gypsy) paints on canvas, using mixed media, (photographic silk screening – collage, acrylic and pen) and taking her inspiration from nature and the Cotswold countryside she loves. 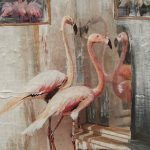 Her art work explores the unusual and nearly always includes animals in unusual settings – their world and ours intermingling. “ As we have invaded the world of animals, I like to think that, through my art work, I allow them to invade our space” Gypsy. Katie McCue grew up in Jersey a stone’s throw from the zoo established by Gerald Durrell, which provided her with much inspiration. A Stroud resident now for over 20 years she has exhibited in Ruskin Mill and The Subscription Rooms, tutors at SGS College in Stroud and delivers art workshops in Women’s Centres in the area. Katie’s paintings explore themes of transformation, fragility, magic and power with her images of flowers and animals. The work is in acrylic and mainly on canvas. 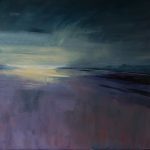 Holly Saunders paints colourful oil paintings inspired by the local landscape. 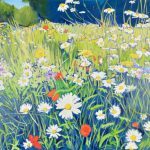 Recurring themes in her work are flower meadows,the banks of the river Severn and herbaceous borders. Holly studied Fine Art at Camberwell School of Art and Kingston University. 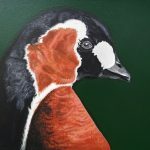 She has had many exhibitions in both Gloucestershire and London and continues to work and teach art in the Stroud area. 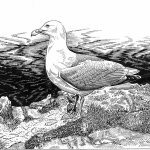 Aimee-Jane Hacker (AJ) is a palaeobiologist and scientific illustrator whose art celebrates the natural history in the world around us. AJ’s collection of art explores the beauty of skulls in acrylic, bringing extinct animals back to life in mini prints and birds in detailed pencils. Her passion and scientific interest for fossils and dinosaurs feature predominately throughout her art.